Thursday was an eventful and action packed day for all Intel Science Fair finalists! With the anxiety that preceded the prior day’s judging session dispelled, we made our way down to the second floor of the Luxe hotel at 7am to satisfy our appetites. Conversation at the communal table was fair-centric. We spoke about the public viewing—which was to take place from 9am to 1pm—, how judging was, and what we thought about our own chances of winning special awards. We assembled in the lobby at 8:30am and set out to trek a path from our hotel to the convention center. During public viewing many students, teachers, judges, and other ISEF finalists crowded our projects and asked us numerous questions. After about an hour or two of posting up at our projects, we took the opportunity to wander the convention hall’s floor and peep at our competition. During one of these spying expeditions we ran into Mr. Andrew Bramante, (research teacher for four of us) Greenwich High School’s critically acclaimed science research teacher, who sparked up conversation with us. Around 11:20am we were given the opportunity to get an ISEF hosted free lunch, which many of us profited from by buying acai super bowls or Greek gyros. After we got our lunch and wrapped up the public viewing session we headed back to the hotel to relax. At 4pm we headed over to Wolfgang Puck for an early dinner with the CT-STEM kids. At 6:30pm we entered the main viewing room for the special awards. Representing Connecticut through the Connecticut Science and Engineering Fair, Luca Barcelo gained admittance into the University of Arizona along with a scholarship to the university. 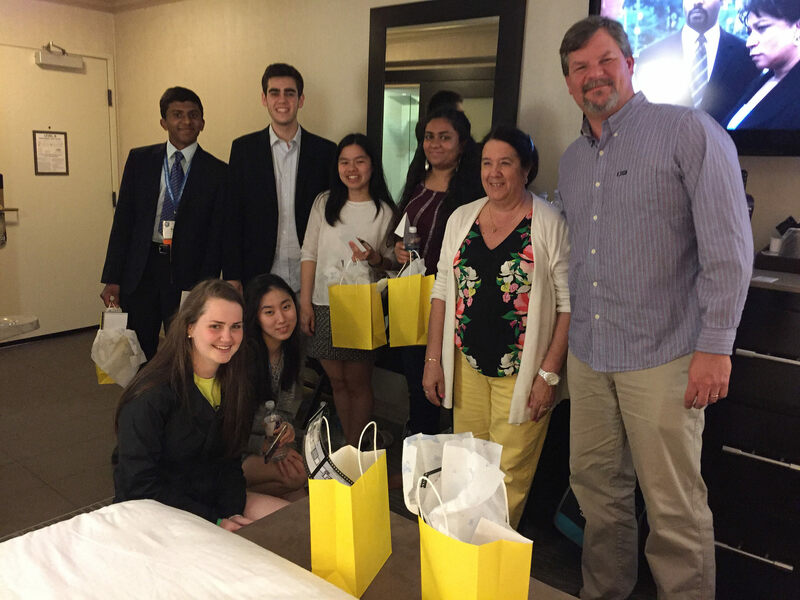 CSEF’s 1st place life sciences winner, Shobhita Sundaram, representing Connecticut new regional CT-STEM fair, won an award from the National Security Agency. We all walked out of the hall with glowing smiles on our faces in anticipation for the next day’s grand awards. At around 9:15pm we all went to Target to buy pints of ice cream and spoons for some late-night snacks. The day ended on a sweet note.